When choosing a secondary antibody, it is important to consider where on the primary antibody you want the secondary antibody to bind. In some experiments, binding location is not important but for others, it is beneficial or even critical that the secondary binds to a specific region. To help you choose the most suitable secondary antibody, we have highlighted the different options for binding locations, their benefits, and examples of their applications. Also included is a schematic of all Ig classes, so you can easily picture the binding location. There are five mammalian immunoglobulin (Ig) classes where the heavy chain differs in amino acid composition and number: IgA (alpha), IgD (delta), IgE (epsilon), IgG (gamma) and IgM (mu). As there are five different Ig antibody classes, it can be advantageous to select a secondary raised against a specific class. 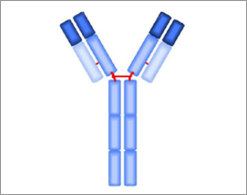 Immunoglobulin classes, subclasses and their binding valency are described fully here. The table below shows the different Ig classes and subclasses/isotypes in human and mouse. Click here for further information on IgA and the antibodies available to this Ig class. Click here for further information on IgD and the antibodies available to this Ig class. Click here for further information on IgE and the antibodies available to this Ig class. Click here for further information on IgM and the antibodies available to this Ig class. Cross reactions are often seen with secondary antibodies. For example, anti-mouse IgG may cross react to some degree with rat IgG, or an anti-rat IgG may show some cross reaction with IgM, and an anti-mouse IgG2a may show some cross reaction with mouse IgG2b. In some cases cross reactivity is not significant, but in others a high degree of specificity is required for accurate data. The initial way to achieve specificity is to use a cross-adsorbed polyclonal secondary. Here unwanted cross-reactivity is removed by pre-adsorption of the secondary antibody with the cross reacting antigen, to yield a more specific secondary and therefore reduce non-specific background staining. As an alternative to this, a monoclonal secondary may be selected that binds to an epitope unique to the chosen isotype. Read our overview on cross-adsorbed secondary antibodies to discover why and how you should use them, how they are generated, and a list of the cross-adsorbed secondary antibodies available now. The nature of the epitope recognized by the secondary antibody can have an impact on the success of an experiment, and it is worth taking the time to consider if this may affect your data. Here we have divided our secondary antibody range into four groups based on the epitope recognized. H/L chain – these polyclonal secondary antibodies have a broad target binding area as they recognize both the heavy and light chains, which are found in all formats (full Ig, F(ab)2’ and Fab’) and classes of secondary antibodies. Example of use - due to their broad reactivity, universal polyclonal secondary antibodies can be used in most applications when specificity is not an issue. See the example of western blotting in the following section: “Detection of light and heavy chains of a mouse monoclonal IgG1 by western blot analysis”. Ig lambda light chain or kappa light chain – light chain specific secondary antibodies will target 25 kDa polypeptides without detecting the heavy chain. Light chain ratios vary greatly between species, and secondary antibodies are not generally cross-reactive, so it is important to establish the specific light chain in your primary antibody when using this type of secondaries. Example of use - western blotting of immunoprecipitates may cause detection problems if the antigen is of a similar size to the 50 kDa heavy chain of IgG, this is because the secondary may detect this component of the precipitating primary antibody. The use of an anti-light chain secondary antibody will prevent this, as only the 25 kDa light chain will be co-detected in the blot. See an example blot in the following section: “Detection of light and heavy chains of a mouse monoclonal IgG1 by western blot analysis”. Gamma chain – these secondary antibodies target the heavy chain found in full IgG, F(ab)2’ and Fab’ formats. They do not cross-react with IgG light chains. Mu chain – these secondary antibodies only recognize the heavy chain on IgM, and as a result, no cross-reactivity is seen with other Ig class heavy chains or any Ig light chains. Alpha chain and alpha 1 chain – these secondary antibodies recognize the alpha chain on IgA subclass, and have minimal cross-reactivity with other human immunoglobulin subclasses. Fc – these secondary antibodies recognize the Fc region of a specific and specified Ig subclass. They can be useful to capture primary antibodies with their antigen binding domains clearly presented. CH2 domain (CH3 in IgM and IgE) – these secondary antibodies recognize the CH2 domain on the heavy chain in the Fc region of a specific and specified Ig subclass. The CH2 domain in an antibody has a role in preventing degradation in vivo, and may be added to therapeutic proteins to increase their half-life. Read secondary antibodies to CH2 and CH3 domains for further information about how secondary antibodies specifically targeted to the CH2 and CH3 domains of immunoglobulins enable the study of the Fc fragments in the development of new therapeutic antibody fragments. CH3 domain – these secondary antibodies recognize the CH3 domain on the heavy chain in the Fc region of a specific and specified Ig subclass. As above, this region plays a role in antibody stability. Hinge region – these secondary antibodies recognize the hinge region of a specific and specified Ig subclass. Fd – these secondary antibodies recognize the Fd region of human IgG. The Fd region is the heavy chain of the Fab, i.e. approximately the first 220 amino acids from the N-terminus of the heavy chain comprised of the VH and CH1 regions. 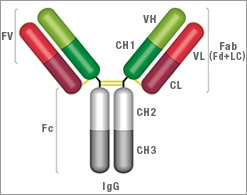 Typically these antibodies show minimal cross-reactivity to the Fc region of human IgG and other human immunoglobulins. Example of use - in an analogous situation to the one described above, the use of an anti-heavy chain secondary can prevent interference with the detection of antigens of a similar size to the 25k Da IgG light chain of the precipitating primary antibody by only detecting the larger heavy chain component. See example western blot data in the following section: “Detection of light and heavy chains of a mouse monoclonal IgG1 by western blot analysis”. 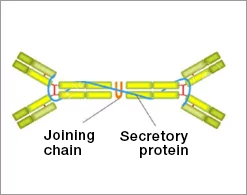 Secretory chain – these secondary antibodies recognize the secretory component of IgA, thought to protect IgA antibodies from degradation and form part of the secretory immunoglobulin (Ig) A (SIgA), when two IgA molecules are covalently bound by a J chain. The secretory chain secondary antibody does not show cross-reactivity with IgM and IgG subclasses. 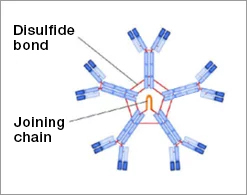 J chain – these secondary antibodies recognize the J chain which covalently links together two IgA molecules, and along with the secretory component, form the secretory immunoglobulin (Ig) A (SIgA). Example of use - although they are not strictly antibodies, they form part of some antibody structures and potentially the basis for discriminating secretory from non-secretory forms. Light chain detection: Rat Anti-Mouse Kappa Light Chain Antibody (MCA152p), clone OX-20 recognizes the kappa light chain of murine immunoglobulins. OX-20 does not recognize mouse lambda light chains or bind to the immunoglobulin heavy chain. Heavy chain detection: Goat Anti-Mouse IgG (Fc) Polyclonal Antibody (STAR120P) reacts with mouse IgG at an epitope localized to the Fc region. Cross-reactivity with IgA and IgM is negligible. 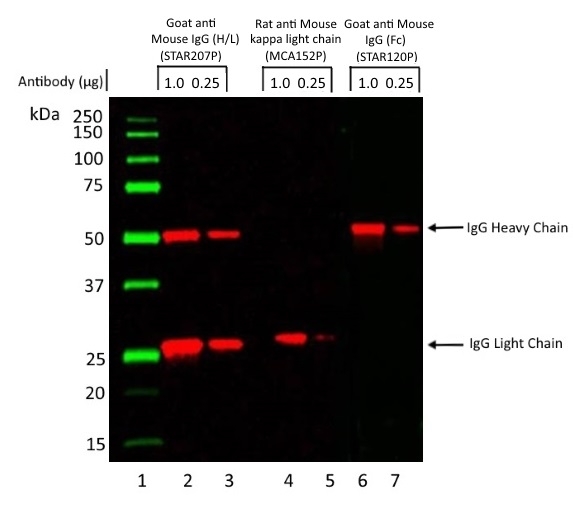 Heavy and light chain detection: Goat Anti-Mouse IgG (H/L) Polyclonal Antibody (STAR207P) reacts with the heavy chains of mouse IgG, and the light chains common to the majority of mouse immunoglobulins. Fig. 1. Light and heavy chains of a mouse monoclonal IgG1 by western blot analysis. A mouse monoclonal antibody of the IgG1 isotype was run under reducing conditions on SDS PAGE using the Bio-Rad V3 Western Workflow and transferred to a PVDF membrane. Precision Plus Protein Prestained Standards were run in lane 1. 1 μg and 0.25 μg of antibody were run in lanes 2, 4 and 6 and lanes 3, 5 and 7 respectively. Protein detection was carried out on lanes 2 and 3 using Goat Anti-Mouse IgG (H/L):HRP (STAR207P) at a dilution of 1/10,000. Detection was carried out on lanes 4 and 5 using Rat Anti-Mouse Kappa Light Chain:HRP (MCA152P) at a dilution of 1/1,000. Detection was carried out on lanes 6 and 7 using Goat Anti-Mouse IgG (Fc):HRP (STAR120P) at a dilution of 1/5,000. Visualization was carried out using the ChemiDoc Touch Imaging System. When using proteolytically derived antibody fragments as primaries, it should be noted that several heavy-chain specific domains are missing from their structure. This impacts the choice of secondary antibody that can be used, for instance anti Fc, CH2, CH3 will not work on Fab or F(ab’)2 fragments. Engineered recombinant antibodies such as HuCAL® technology generated antibodies, may not contain certain domains depending upon their exact structure. Please consult the HuCAL Antibody Technical Manual for further details. In the case of HuCAL primary antibodies, one or more tags such as DYKDDDDK or Strepavidin are incorporated into the structure to enable detection by anti-tag secondary antibodies. 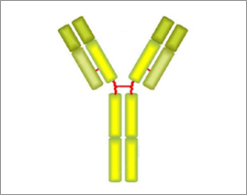 In addition to monoclonal and polyclonal secondary antibodies with full length Ig structure, other secondary antibodies are available in different formats. Below are schematics of F(ab’)2 and Fab’ antibody structures and the benefits of using them as a secondary antibody.